Now compare these two sets, Cuc’s and mine. 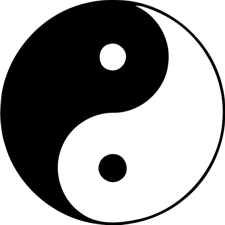 For example, Cuc places ‘yin’ in the YANG column, and ‘yang’ in the YIN column. Doing that turns the ‘correlation’ process into a ‘rationalization’ process. When rigorous thought ebbs, rationalizations flow. You easily end up rationalizing the view to fit what you emotionally wish to see. “Taking” and “killing”, for example, are very active relative to their opposites, and so belong in the active YANG column along with the other active words. “Death”, on the other hand, correlates to YIN. Death is eternal, universal, passive; killing is transitional, particular, and active. It may seem ironic at first, but killing and life are both similar and belong on the YANG side. I understand why Cuc put ‘I’ and ‘nothing’ on one side, and ‘you’ and ‘mystery’ on the other. This order can make sense when just pondering these few words in a detached way. Such a detached view becomes harder to entertain as you work toward correlating all the contrasting verbs and adjectives that readily come to mind; this could be hundreds. The more rigorous and comprehensive your initial work to reconcile synonyms and antonyms, the more coherent the view. This helps you better feel the deep complementary relationship between words. Next, you’ll begin to feel the illusion of difference, and this helps disentangle words from ‘reality’. I know, that’s a leap, so proceed step by step. The proof is in the pudding. Alas, it is a subjective pudding that each mind must put together on its own and taste to prove. Correlations is just one way to untangle the knots as chapter 56 puts it.